The Black Sapphire is a piece of Apeks diving history, a limited-edition anniversary regulator celebrating 40 years of technical excellence and precision-engineering. With new styling across both the first and second stages, the Black Sapphire features a precision-machined, aircraft grade anodised metal front cover, which retains the crafted machining marks created during its production. The first stage has a super-tough and luxurious Physical Vapour Deposition (PVD) coating and features five ports as standard to allow for flexible hose routing. The Black Sapphire is packed in a special anniversary reusable case, perfect for storing your kit. Precision-machined and anodised metal front cover. Luxury hard-wearing PVD finish on the first stage. 5 ports with heat exchanger as standard. Reversible second stage can be converted from a right-handed hose configuration to a left-handed hose configuration and can mount to either side of the first stage. The carbon-coloured hose features a swivel joint on both the first and second stage for maximum comfort and range of movement. Hydrostatic over-balancing first stage allows the medium pressure air in the hose to increase at a rate faster than ambient pressure, resulting in superior performance at depth. Comes as standard with an environmental dry seal kit which keeps water and contaminants out as well as making the model more resistant to freezing. 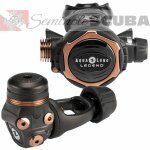 Features the innovative Diver Changeable Exhaust (DCE) system allowing the diver to change from a large air exhaust to a smaller air exhaust. The larger exhaust provides the best exhaust bubble dispersion while the smaller exhaust is lightweight and compact. Both are included with the regulator. A two-stage progressive dual purge to allow the diver to choose the flow rate of the purge. 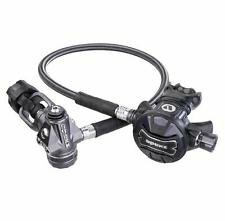 The pneumatically balanced second stage has diver-adjustable controls that allow the diver to individually tailor the breathe of the regulator to meet his or her needs. Suitable for cold water use (below 10c / 50F).